Physically and mentally prepare for the upcoming minor hockey season. The Director of the Canadian School of Hockey Officiating (an appointed position by the GTHL Board of Directors) manages the Referee Summer Camp. Curriculum support is provided by the GTHL Technical Director of Officiating. Referee Summer Camp is suitable for all males and females 16 years of age or older by the end of the calendar year. Participants from the USA and other countries are eligible and welcome to attend. Senior Refresher: A program for senior officials who want to prepare for the season by participating in a recertification program that is slightly more comprehensive than the standard HCOP recertification clinic. Each of these programs involves classroom work, on-ice training sessions and evening game assignments. 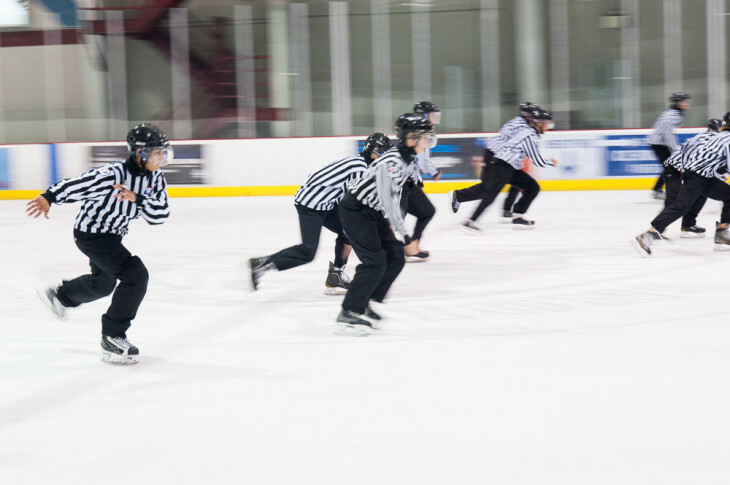 Expert instruction, supervision and mentoring for the participants is provided by experienced National Hockey League officials and certified Hockey Canada referees and instructors from the Ontario Hockey Federation. Note: If you do not have an eHockey account, please create the participant as a New User. Please note that each person in the registry must hold his/ her own eHockey profile connected to their very own email address.